Updated Tuesday February 26, 2019 by LMLL. Tryouts for all Baseball and Softball draft divisions began on Monday, Feb. 25th. What better way to get ready than a quick trip to Modells . . . with special LMLL discounts. 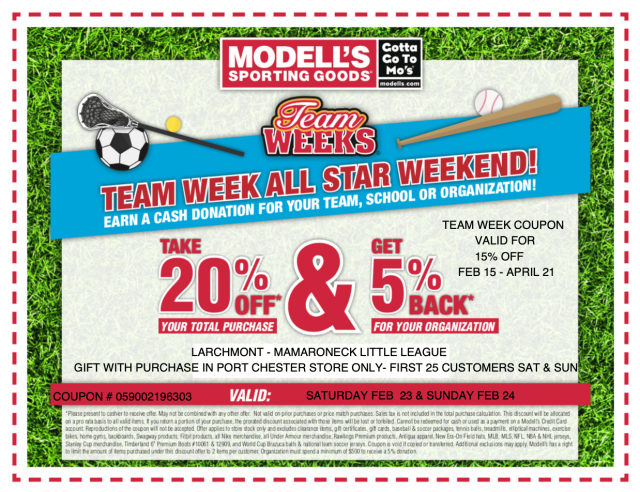 Use the attached Modells coupon to save up to 15% on your total purchase (the 20% was only applicable during the Feb 23-24 kick-off weekend). And an additional 5% of what you spend will be donated back to our league. The discount is available at all Greater NYC/tri-state area locations. Click on the attachment below to print out the coupon. Share it with your family, friends and anyone else you want!